You are here: Home / Uncategorized / Five Reasons not to get real bunnies for Easter. Five Reasons not to get real bunnies for Easter. I love Bunnies and I love Easter, you may have guessed from my previous posts but I am slightly worried about the practice of buying real rabbits for Easter gifts. 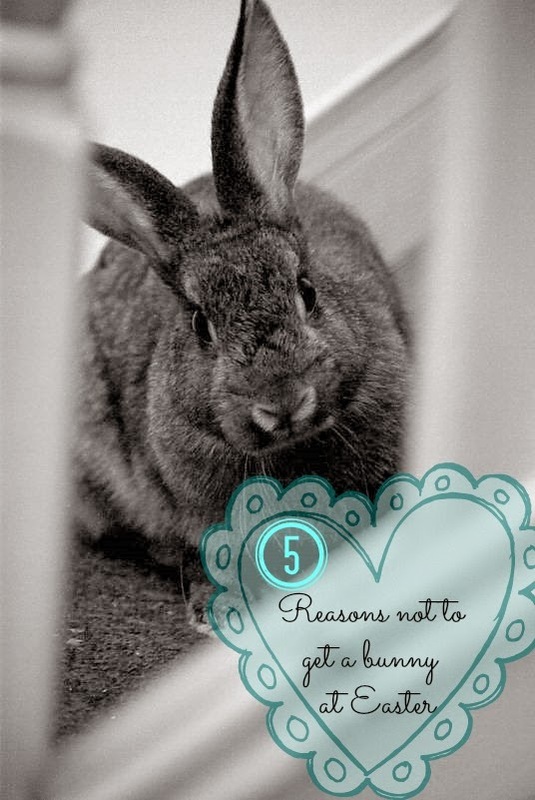 And I am here to tell you my five reasons not to buy a bunny for Easter. BUNNIES ARE CUTE BUT …..
We have a Bunny, her name is Cookie ( that is her above) and she has been with us now for nearly five years since she was a baby. We adore her and as bunnies go she is brilliant BUT and it is a BIG BUT I would never recommend a rabbit as a pet for a young child. Reason 1. Rabbits can be incredibly territorial and aggressive. Trust me if you ever hear a Bunny grunt you know it means business. 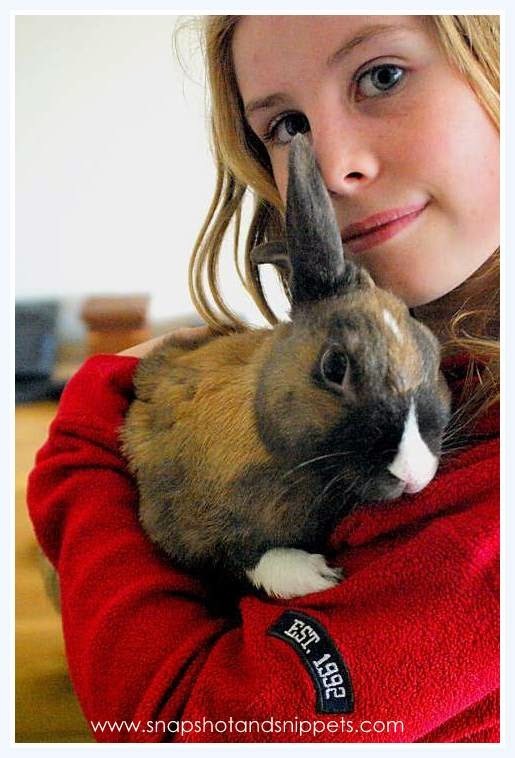 They can bite, kick and not just their owners but other pets, even other rabbits. Bunnies are also nervous, being prey animals their natural instinct is to run and they are not fond of being picked up and cuddled. They need gentle handling and patience which not all small children can give them. They require a special diet and they have the most delicate tummies. If you change food it can trigger a reaction in them and it is not a nice one! And you would be amazed at a number of people who think bunnies can eat lettuce, no they can’t! Lettuce is too watery for them. And they generally don’t eat carrots either, carrot tops yes but carrots are quite calorific for a bunny and we only give Cookie carrots in winter to help her with the cold. They mostly eat hay and bunny food and greens like cabbage and spinach. They also eat their own poop, there I said it if you can’t handle it a bunny is not for you. Reason 3. Bunnies will chew on everything. If you have them indoors they will chew on carpet, cables, your crochet which you carelessly left in its path…. Oh and they dig, it is what bunnies do well, other than the other thing we won’t mention! So prepare for holes in your lawn or your carpet or your newly dug veggie patch. 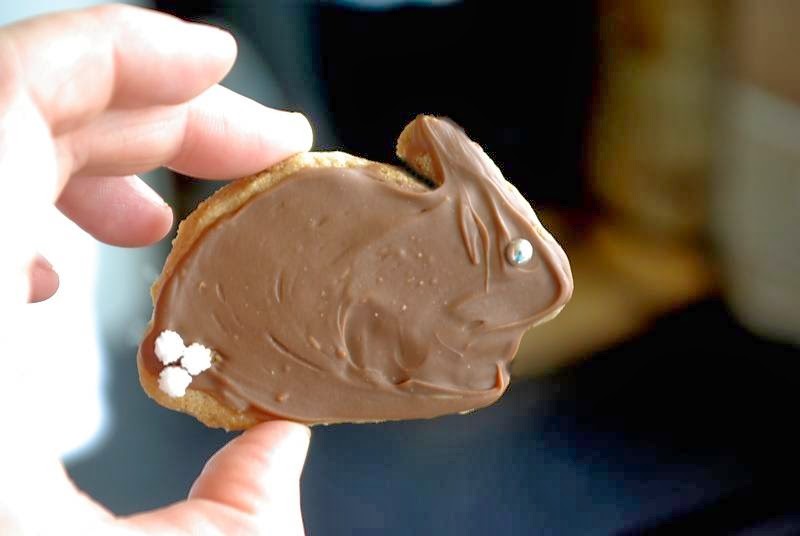 Our poor bunny Cookie is the result of inbreeding in a pet shop. She was the runt of the litter, my daughter always picks the helpless one! As a result, she has a misaligned jaw, this means she needs bunny braces. And as orthodontists for bunnies have yet to be a thing, she requires her teeth trimmed once a month or she turns into the sabre-toothed bunny. This used to mean an expensive trip to the vet until the kind vet taught me how to do it myself.Cutting a Bunny’s teeth is not for the faint-hearted. Lucky for us Cookie quietly lies in my arms while I wield a metal clippers. Looking for all the world like a female version of Dexter. It doesn’t hurt her I might add, the vet described it as like us trimming our nails. But the truth is Cookie could live for another five years so that is some commitment if you couldn’t face it yourself. True this is not something all bunnies suffer from just ours. But think can you handle it if your rabbit gets sick? Bunnies poop A LOT – so you have to clean regularly. Now the good things about your bunny is they can be litter trained. Personally, I love bunny poop because it is great in my compost bin. 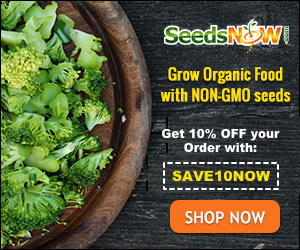 If you are not an organic gardener you might not love this part of bunny care. I am not a bunny hater at all let me make that clear. We have rescued bunnies for years now and I have loved every one of them. Truth is bunnies, like any pets, can bring you years of joy. 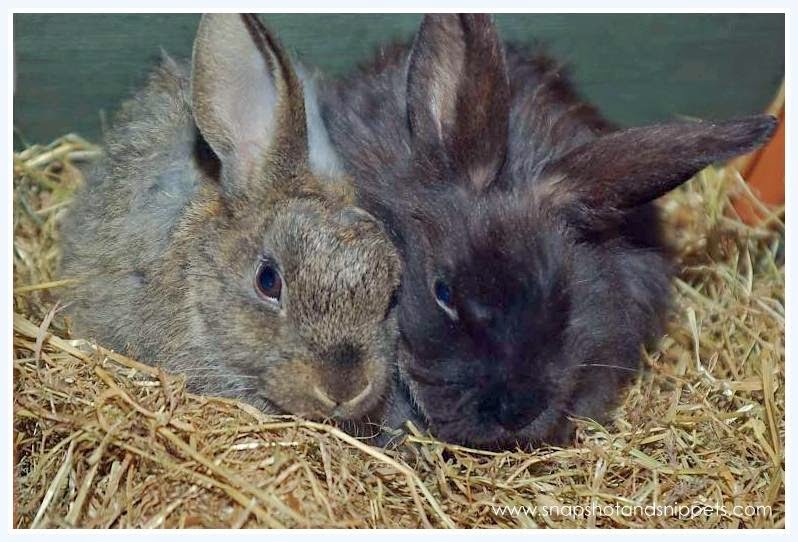 But if you are thinking of a rabbit for Easter do your homework and find out all the facts there is great information HERE at the DSPCA . And why not rescue one – you would be surprised how many need help. If you enjoyed this post about pets we have a few pets you can read about on my About Me page.Or check out theses Pet posts below. Is it hard to keep Chickens? Very good points. I'm not a fan of getting a pet for any gimmicky reason. Thank you for being a bunny rescuer! Heidi – in our house Santa doesn't bring pets either ( otherwise we would have a stable of ponies 🙂 Nice to think I am not alone thinking this way. My hubby is deathly allergic to cats and I've heard rabbits have similar allergens. Is that how you would say that I don't know but you get what I mean. I am a big believer in family pets that the whole family can enjoy, which means picking out the pet together, committing together. Great post! (One day if I ever have the time to build a coop and devote my life to it) I want to get my kids chicks for Easter. But I'l have to see if they grow up like their FFA mama. Following from link'n blogs link party! Your poor husband would be in bits in our house Alicia – three cats, one bunny, two fancy rats and a gerbil it is allergy central. I too want chickens it is my dream to have free range ones when we move to a bigger house maybe. A good post, because I – like you – know that you have to take good care of any pet. I love bunnies/rabbits and yours look very cute!